Wildlife Conservation Systems. Award Winning Conservation Technology. NFC Group’s mission is to help build smarter and more secure cities and rural areas for a better and more connected future, but we believe that progress should not come at the expense of the environment and the stunning wildlife that inhabits the world we live in. In addition to helping all industries reduce their carbon footprint and be more sustainable with our Orion Data Network, we also create bespoke solutions for a wide range of Wildlife Conservation Projects. We understand that every animal and every conservation project is different and we always work alongside our conservation clients to gain deep insight into the individual needs of each specific project, so that our solutions are genuinely bespoke and achieve your conservation project goals. Every wildlife conservation project is different. Factors such as terrain; environment; local community needs; power supply; temperature; and the species, size, behaviour and physiology of animal being protected, all have a huge impact on how we design and create the most effective solution for your requirements. One of the biggest and most malignant challenges our conservation clients face, is unauthorised site access, hunting and capture by poachers, game hunters and traffickers. Other challenges include the remoteness of many conservation areas and the lack of independent power supplies, the need for a cost-effective and scalable solution and the fact that each species of animal requires a different tracking device design that complements their body shape and daily habits and does not interfere with their natural behaviour. 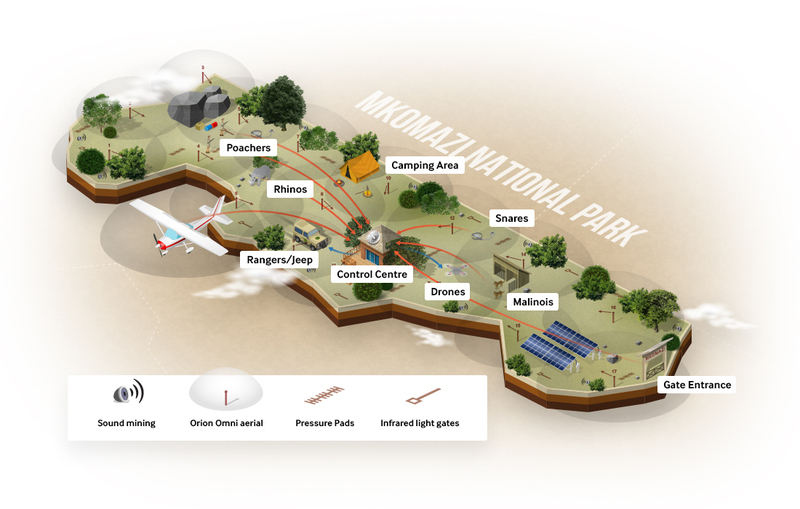 The Orion Data Network uniquely combines Radio Frequency Identification, GPS, non-GPS and IoT connected sensor technologies within a tag and gateway system so you can monitor, track and recover your conservation assets and the wildlife you are protecting while also securing the conservation area with perimeter security, gate sensors and surveillance systems. There are 3 types of Orion tag, GPD for tracking, non- GPS for use with tamper, shock, tilt, temperature and other IoT enabled sensors and switch tags which monitor smoke, fire and other detectors. There are also 3 types of gateway available to give you total asset and wildlife coverage even in very remote and hazardous terrains. These are ethernet which can be wired or wireless; mobile and independent satellite, giving you global coverage so you can track your assets and animals within your conservation site; in transit to other sites, in the field, in storage or indoor habitat and throughout the entire supply chain. This gives you total 360-degree visibility 24/7, with total control and simplified management over all your assets, animals and key personnel. When dealing with potentially dangerous animals, poachers and intruders, your lone or vulnerable workers can also take advantage of our panic buttons and SOS devices, with optional two-way communication. When creating tracking devices for animals, we tailor the design of the hardware, which carries the tracker, so it is made of a sufficiently robust but comfortable material; is the correct weight; and it attaches to the animal in a way that is palatable, safe and secure, ensuring that it cannot catch on trees and foliage and the animal can move properly to hunt, drink eat and mate. An example of such hardware is the W360 wildlife tracking collar that we designed for tracking Black Rhinos. These solutions provide invaluable conservation data every 30 seconds when your asset or animal is on the move and every 2 minutes when they are still. You can pre-define exactly what kind of data you need to collect so that Orion sends you reports and alerts on location, movement patterns, health, habitat utilisation, population demographics, poaching incidents and escapes for your animals and loss, theft and damage of other valuable assets. To discuss how the Orion Data Network can benefit your conservation project contact one of our experts now.